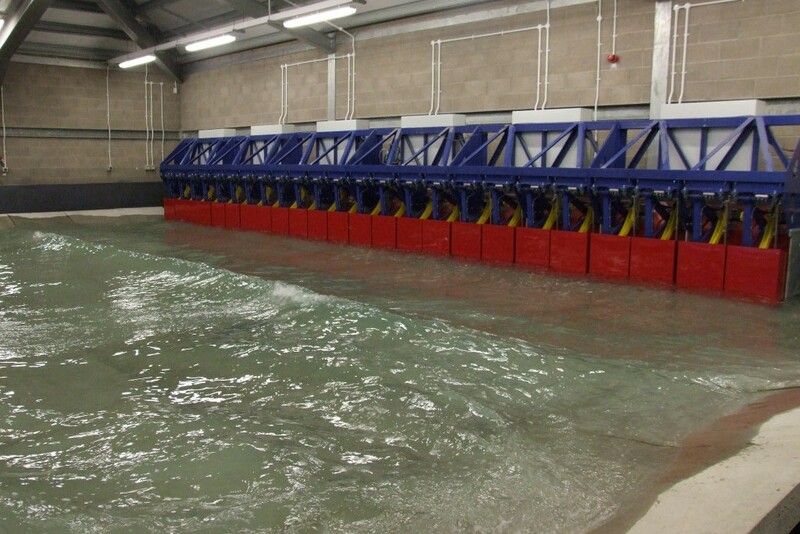 Edinburgh Designs piston wavemakers are suited to generating shallow water waves for coastal engineering research and testing of near-shore structures. The unit uses a displacement technique that allows perfect flat front piston action but generates no back wave. The piston motion is ideally suited for generating coastal or shallow water waves. Piston wavemakers can be used in tanks containing sediment or dirty water as there are no seals, hinges or bearings in contact with the water. 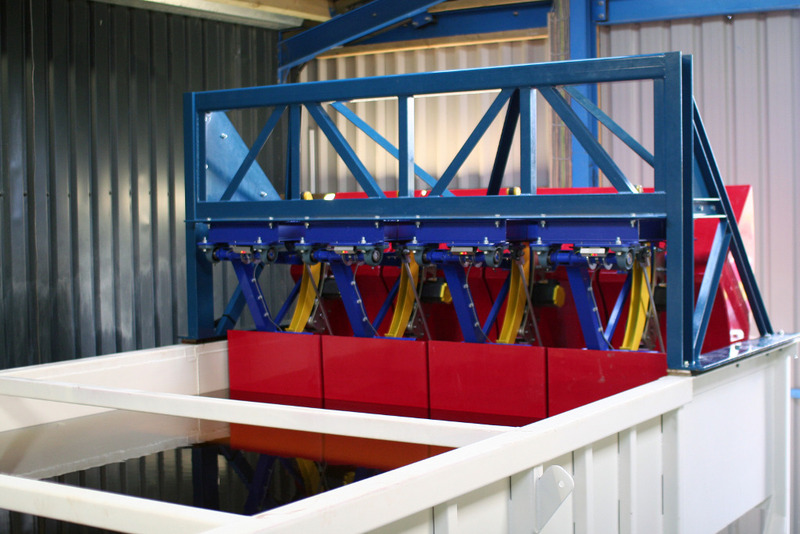 Piston wavemakers can be supplied as units to fit the end of a flume or as self-contained 4-piston modules which are reconfigurable after installation by the user. Piston design is ideally suited for generation of shallow water coastal waves. Waves that can be generated are fully user-definable and include regular waves, any random sea spectra (e.g. PM, JONSWAP, gaussian), focus wave events, long creasted waves, short creasted CosN and Cos2N waves (in multi-paddle tanks) and time series specified waves. Force absorption maximises repeatability of experiments and reduces the buildup of unwanted wave energy in the tank. Displacement sector-carrier design creates no back wave and requires no seals or mechanical moving parts in the water. Can be used with variable water depth on the paddle. Paddles can be placed anywhere in the tank. Coastal modular units can be moved after installation by the user and reconfigured in different locations. Paddles can be arranged conventionally in a straight line opposite a beach, in a curve, or opposite each other (as an active beach). Servo drive mechanism gives quiet, efficient operation. 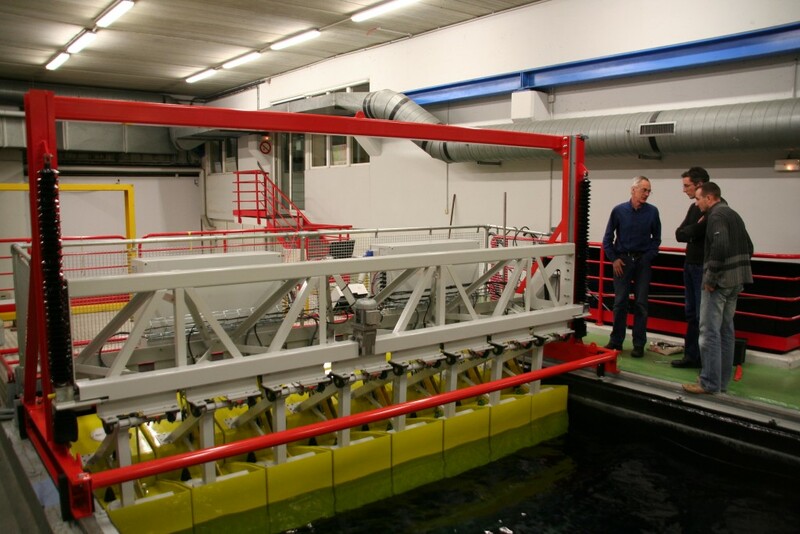 Traditionally wavemakers work with a position feedback control system to create waves. This has the disadvantage that the swept volume of the paddle is dependent on the water level in front of the paddle. So the generated wave height is dependent on many factors including the size of reflected waves from models or poor quality beaches. The Edinburgh Designs wavemaker measures the incoming wave and corrects the paddle motion to absorb it. The resultant wave field is totally predictable even with highly reflective models. 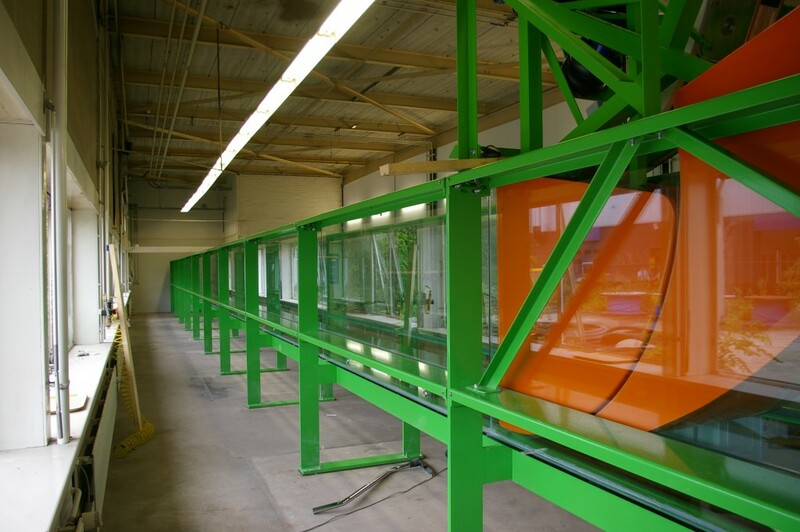 Repeatability is better than 1% allowing results from multiple sequential runs to be combined. The force absorption technique uses two reliable transducers well above the waterline. The technique is significantly easier to use than wavegauge absorption because the transducers do not require setting up or calibration. Each paddle has an robust brushless AC servomotors that drives a belt running over a curved guide on the top of the paddle. The control electronics, power amplifier and power supply are contained in a self contained robust steel cabinet. Maintenance is simple with all major components easily accessible well above the waterline. The displacement piston wavemaker consists of two interconnected shapes that rotate relative to each other. The rear surface of each of the components forms part of a cylinder centred on its axis of rotation, so no back wave is formed when the structure rotates. The largest force on the piston is the buoyancy followed by the wavemaking and the inertial forces due to acceleration. The structure is light and corrosion resistant. Drive is by brushless AC servo‑motor driving a belt fixed to a drive sector fitted to the piston. The support structure holds the displacement piston in a modular unit. The upper section of the structure has the mountings for the motor, air springs, operating linkages and main rotation hinge. 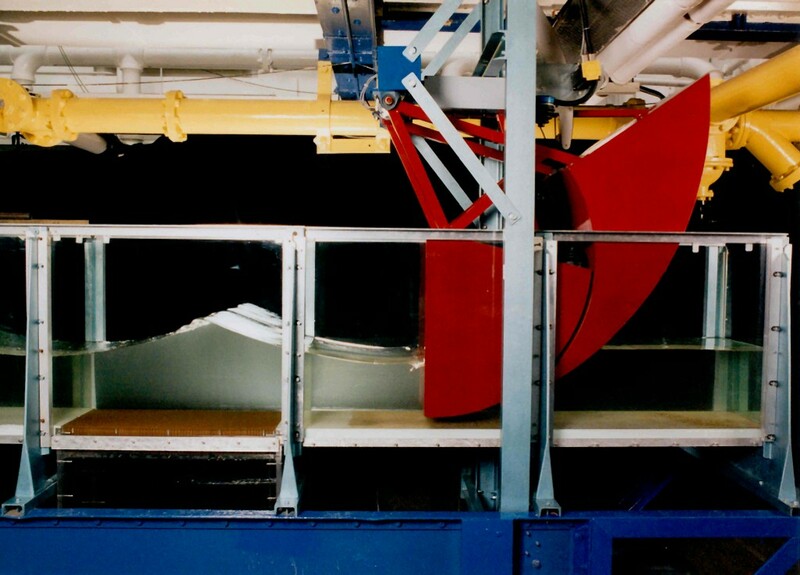 It is possible to position the paddle assembly anywhere in a tank. The sector-carrier creates no back wave so requires no back sump. The absorbing wavemaker creates high quality waves that are stable within a distance of three water depths from the paddle face. Valuable research can be conducted in laboratories that are too short for a traditional tank. 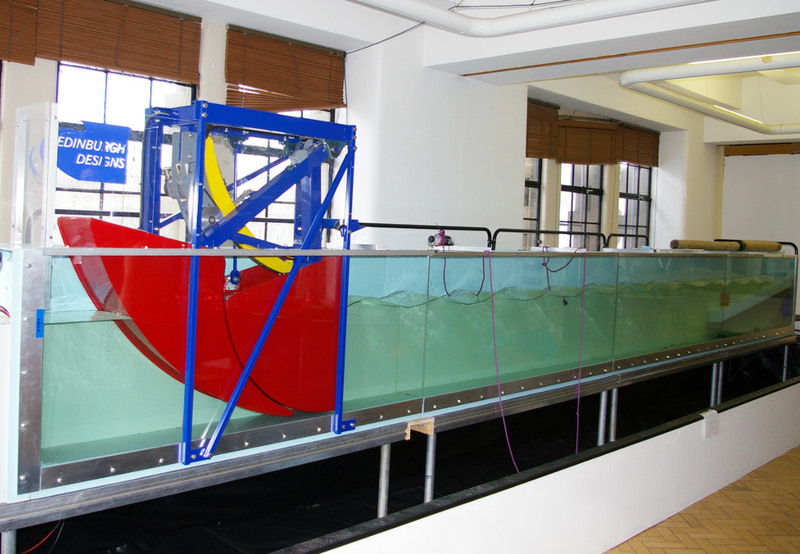 The paddles can be placed opposing each other at either end of a tank to form an active beach or side by side to control crosswaves. 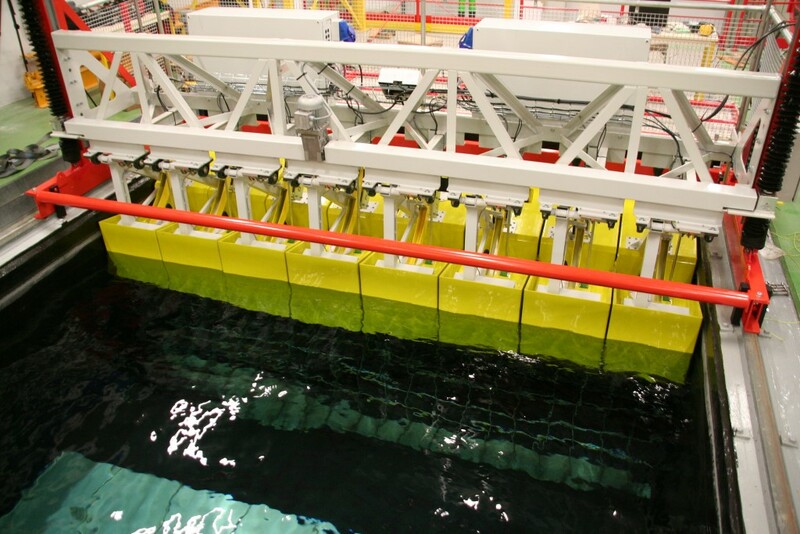 Multiple paddles are controlled by a single computer that can be placed up to 50m from the wavemaker.